Kingston CFF/128GB, 128GB Canvas Focus Compact Flash, read/write: 1504/130 mb/sec - retail pack Copyright © 2019 ComXpert International CC - COPYING IS ONLY ALLOWED FOR THE PURPOSE OF SENDING US ENQUIRIES. E&OE. Kingston’s Canvas Focus™ Compact Flash card is ideal for content creators who use DSLRs or other CF enabled cameras. You can be confident that your memories will be safe on your next photo or video shoot. It’s available in multiple capacities up to 256GB, to provide plenty of space to capture an entire shoot. Kingston Canvas cards are tested to be durable, so you can take them anywhere with confidence that your photos, videos and other data will be protected. The best price and guaranteed service and backup from official computer suppliers in South Africa for the CF-128GKCF Kingston Canvas Focus 128GB Compact Flash. The Kingston CF-128GKCF Kingston Canvas Focus 128GB Compact Flash is available for R1190. The product is sold by ComX Computers as new. Prices are valid today 2019-04-22 (before 2019-04-23 , by quote, while stocks last). The product is expected to be in stock, although this is not guaranteed. 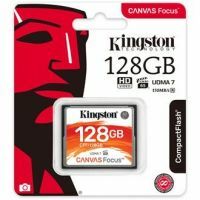 Find related CF-128GKCF Kingston Canvas Focus 128GB Compact Flash products in our CF (Compact Flash) Category for even more options. Read reviews and find out about CF-128GKCF Kingston Canvas Focus 128GB Compact Flash. Discounts, specials and cheap prices only at ComX Computers.